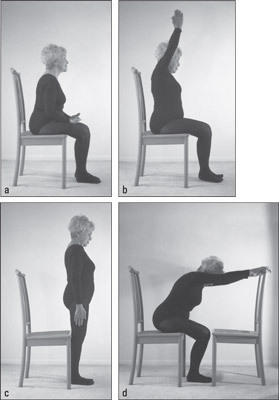 Try the following gentle Power Yoga exercise routine working from a chair, and see how energized you feel. This exercise helps relieve stress and tension in your shoulders, it expands your chest, and it helps to loosen up tight joints as it strengthens your arms and legs. Sit in one chair, with your spine straight and shoulders back, hands folded in your lap. Take a few slow, deep breaths, and relax. As you inhale, lift your arms out to your sides and over your head with palms touching, as if you’re clapping your hands. Exhale, and lower your arms to the starting position (hands in your lap). Keep your shoulders away from your ears as you do. Remember to inhale as you lift your arms and expand your chest. Exhale as you lower your arms and relax. Repeat Step 2, inhaling and lifting your arms over your head; exhale as you put weight on your feet and come to a full standing position, with your arms by your sides. Sit back down in your chair, with your spine straight and shoulders back. Repeat Step 5 for five repetitions. Close your eyes and relax for 10 slow, deep breaths. Bend forward at the hips, resting your torso on your thighs, and place your arms on the chair in front of you. Hold this position for 5 slow, deep breaths. You’re doing the two-chair stretch, which stretches your torso. Come back to a sitting position and relax.